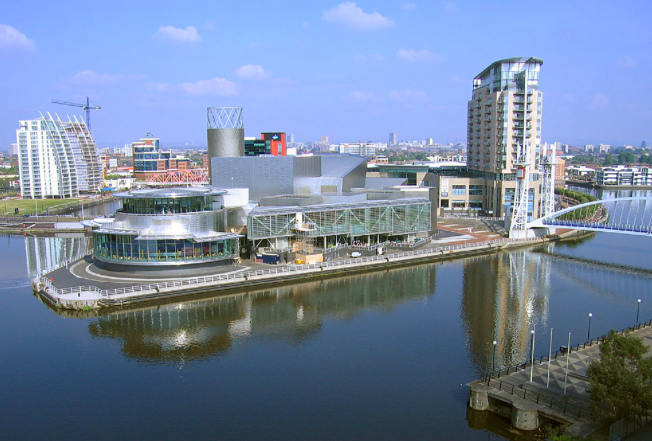 Home to MediaCityUK, Salford Quays is one of the North West’s best sporting, leisure and entertainment destinations. As Manchester’s leading waterfront location, the area boasts some incredible attractions, buildings, bars and restaurants and makes for a great day out. Located 15 minutes from Manchester city centre, Salford Quays is a world-class visitor and multifaceted destination. Having had a profound effect on Manchester’s tourism, it is now one of Britain’s hottest short-break destinations and offers everything you’d want and expect from a city, in just one square mile. Sport, drama, shopping, food, drink, arts, architecture and history – whatever you’re looking for, you’ll find it in the Quays. Live theatre, art shows, exhibitions, cinema screenings and one of the country’s best museums – The Quays is home to plenty of things to do and see for all ages. Spend your morning, exploring the Imperial War Museum North, which offers self-guided tours and interactive experiences. Afterwards, head to The Lowry, another example of the striking modern architecture that surrounds the area. The Salford Quays heritage trail or BBC tour is guaranteed to entertain the whole family and why not pop in to the see the set of Coronation Street on a MediaCityUK studio tour? As you get off the tram, you’re surrounded by a number of fantastic bars and restaurants ideal for a little refreshment. Cau, Prezzo, The Botanist and Alchemist are some of the area’s most popular haunts and locals also flock to The Dockyard for a burger and beer. Plus, in the summer, look out for beanbags, deck chairs and tiki bars which adorn the green spaces. Head over to the Lowry Outlet and shop until you drop. Whether you love a bargain or just love to shop, this outlet store offers big name brands at discounted prices. Plus, there’s plenty of places to rest your feet after a long day. Sports fans will also be pleased to hear that the Quays is home to two of the most popular clubs in British sport – Lancashire Cricket Club and Manchester United Football Club. Whether you want to pick up some official merchandise, take part in a stadium tour or want to spot some famous faces, it’s all within each reach of Salford Quays. As with everywhere in Manchester, apartment blocks and high-rise flats are shooting up in Salford Quays. Currently one of the most sought-after areas in Manchester, the Quays offers luxury city living with waterside views. As one of the first and biggest urban regeneration projects in Greater Manchester, millions of pounds have already been spent on the area and many TV presenters, footballers, actors and actresses reside here. Imperial Point, NV Buildings, City Lofts and the Millennium Tower are some of the most popular resident blocks. Well served by public transport and easily accessible from Manchester city centre, Salford Quays is easy to get to wherever you’re coming from. The Metrolink runs frequently and taxis into the city are also relatively cheap. As one of Manchester’s, up and coming areas, Salford Quays is just one of the reasons that makes Manchester such a fantastic place. If you have any questions or are looking for a property in Salford Quays, get in touch today. Plus, remember to keep an eye out for next month’s city spotlight.